Jenny and Alex met in Greece. They were both on holiday at the same time in Crete. Alex was with his friend (and Best Man) and Jenny with a work friend. 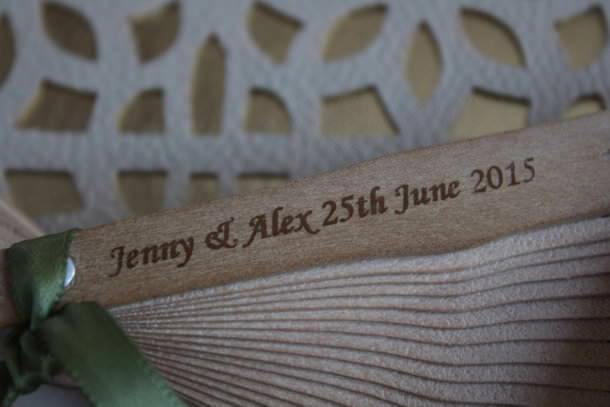 Alex walked in the bar and Jenny’s friend said immediately ‘don’t turn around but I’ve just seen the man you are going to marry’, Jenny turned around though, saw Alex and they got talking. They arranged to meet up when they got back to the UK and the rest is history! Jenny had always known that she wanted to marry abroad rather than in the UK. 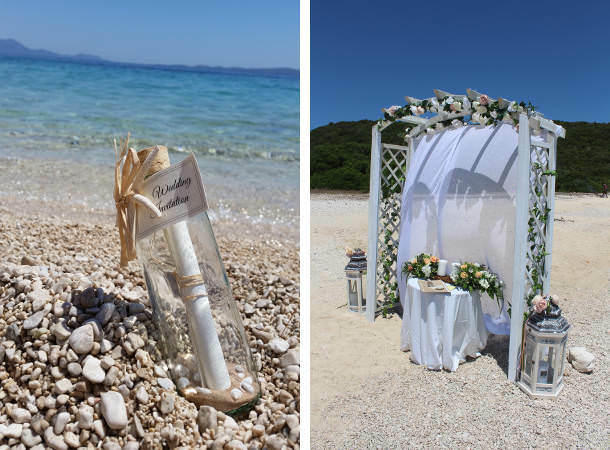 Alex's cousin has lived in Lefkada for several years and this prompted them to look at pictures of the island and consider it as a place to have their wedding day. They visited Lefkada last summer for a few days and fell in love with the island, deciding that it was the perfect destination. 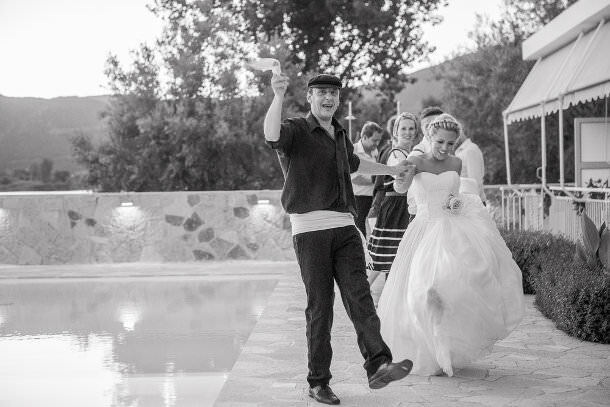 Alex's cousin had already recommended the venue and knew Claire at Lefkas Weddings so their wedding story began. 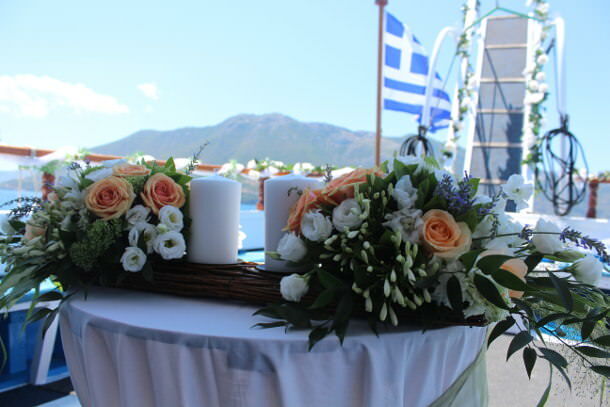 "We were married on the secluded beach of Gerakas which can only be reached by boat. Our guests enjoyed pre-wedding cocktails at NV Nikiana before cruising over to the beach." 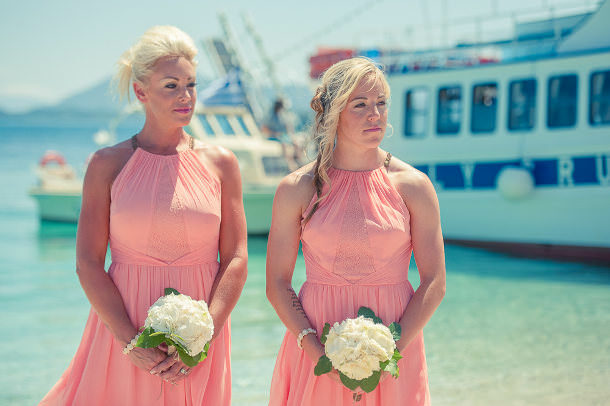 Jenny and her bridesmaids arrived by speedboat afterwards. 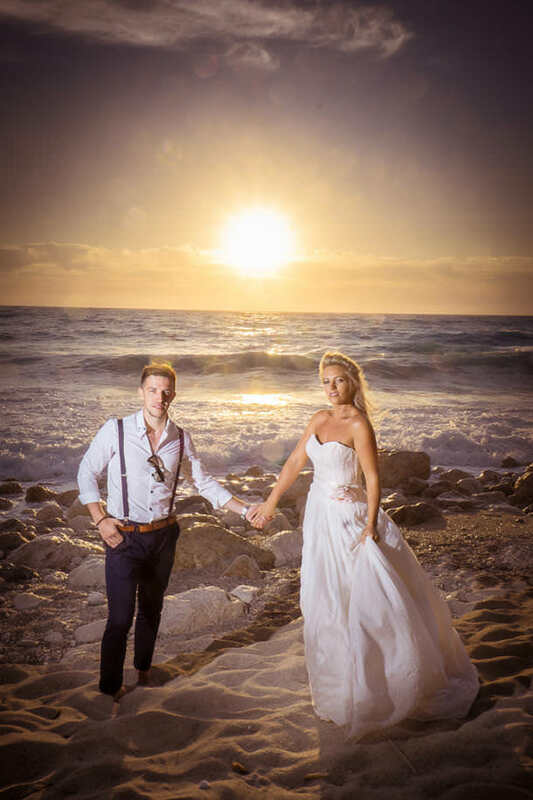 "The ceremony we personalised with our own vows and we had an acoustic guitarist who played throughout the time on the beach. The view from the beach was stunning, it felt like our own piece of paradise." 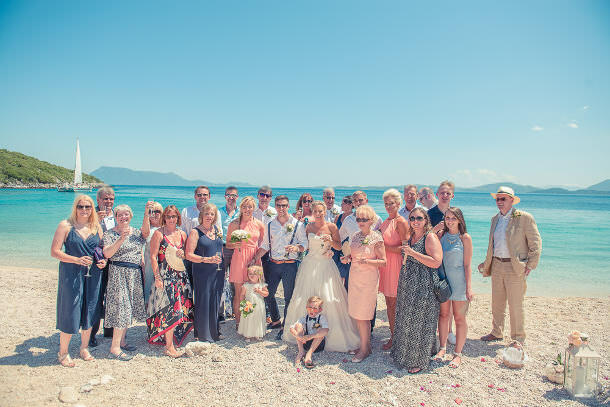 "The celebration began on the beach after the ceremony, everyone enjoyed champagne in the sunshine before cruising over to our reception venue. 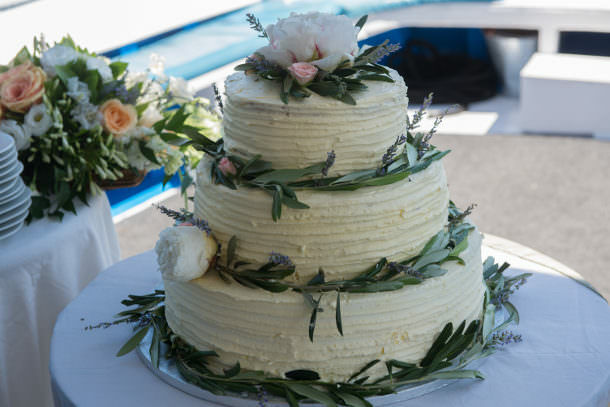 Claire suggested we cut and serve our wedding cake on the cruise from the beach and this worked beautifully. We both thought it was a fun moment and it tasted amazing, I don’t think there was any left over!" 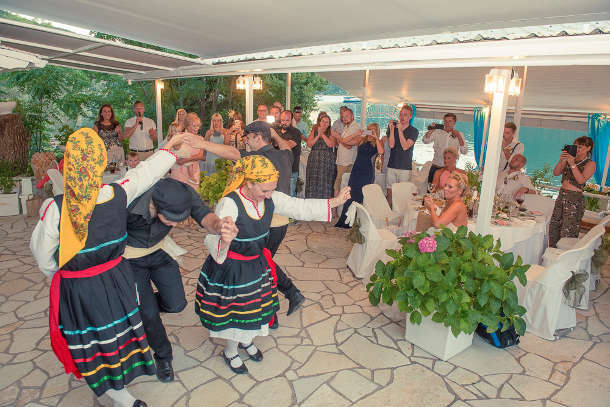 "The boat took us directly to the Seaside Restaurant and we had Pimms and Lemonade for everyone before sitting down to a traditional Greek dinner. The evening started with Greek dancers and all the guests got up and danced too, we finished the evening with a party and dancing. Alex and I left the restaurant by speedboat and the jetty was lit up with firework fountains!" 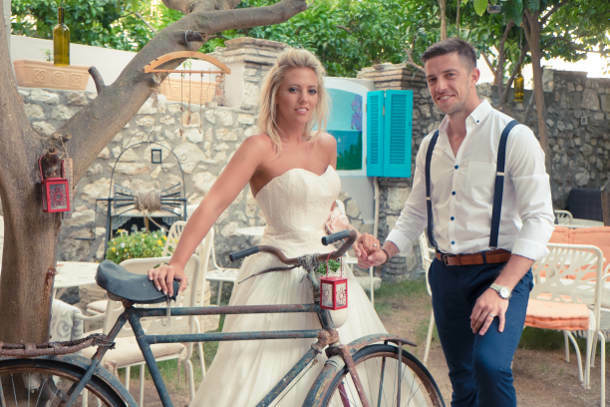 "We planned the wedding with Claire at Lefkas Weddings and it was very easy. 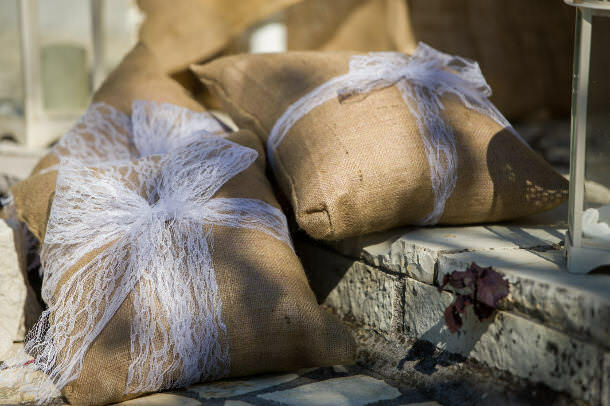 It was done through telephone calls, emails and we met up to go through the final details. 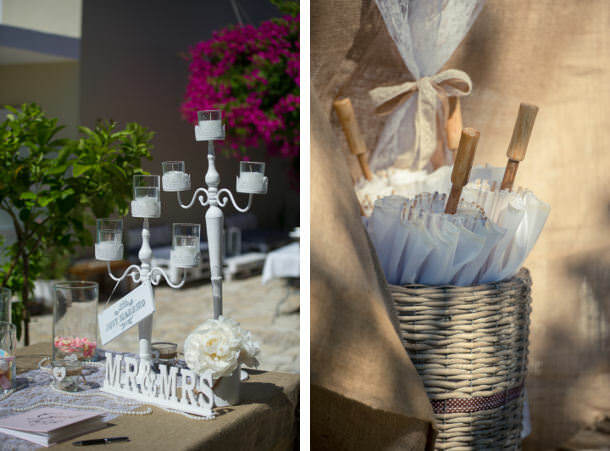 It was all arranged for when we arrived in Lefkada for our wedding stay. 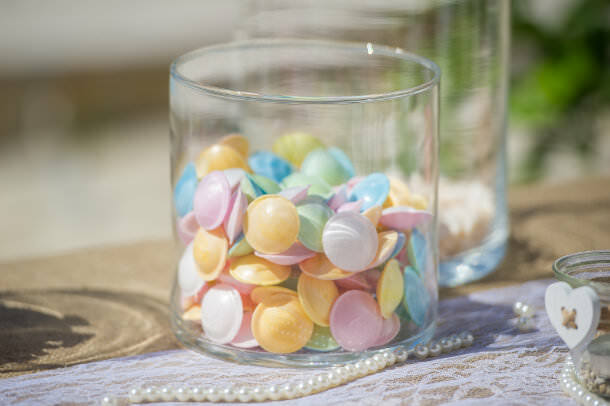 I had been searching Pinterest for inspiration and the pastel colours I have always liked. 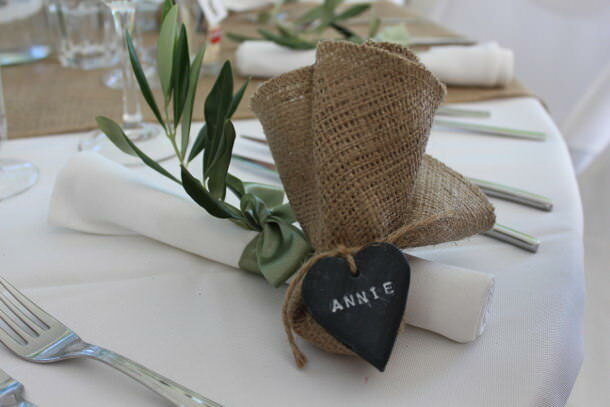 The burlap for the tables complimented those colours and added to the romantic look we wanted. 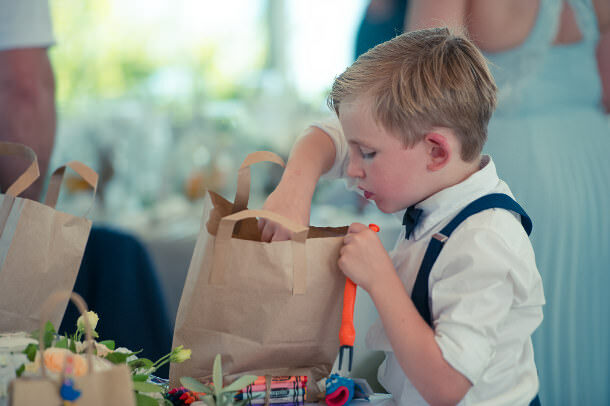 Claire worked with the florist to turn our Pinterest ideas into exactly what we wanted. 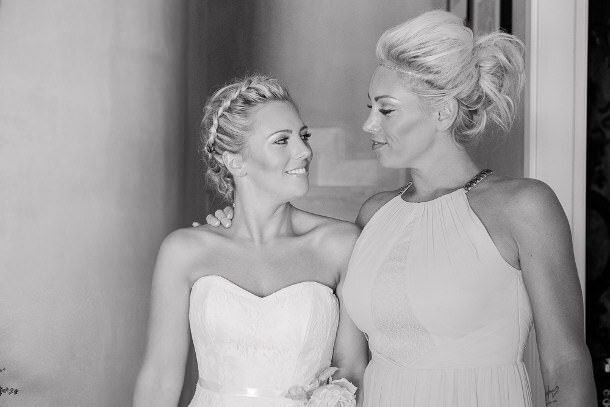 Peonies are my favourite flower and so I was delighted with my bouquet which was stunning." 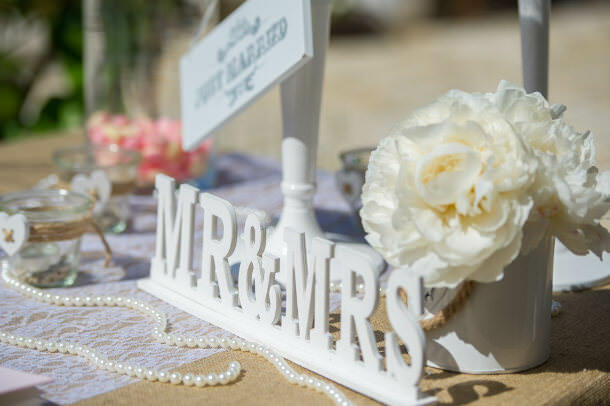 “Don’t think about having a destination wedding, just do it! Lefkada is so beautiful and has an amazing atmosphere. By going abroad we were able to have an entire wedding week instead of just a wedding day with our family and friends. Speak to Claire, she will help you with everything." "The pre wedding boat trip earlier in the week was a good idea and everyone got to know each other better. Particularly popular was the ‘Wedding Belle’ cocktail created especially for the cruise by owner Jane Verikiou Flinders and her crew." "We opted for a second photo shoot in addition to our wedding shoot. 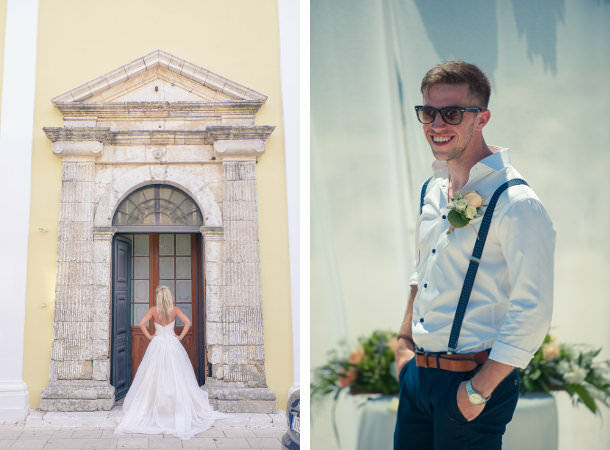 We were married on the East coast and we wanted to capture the stunning sunset on the West coast of the island and the architecture of the capital Lefkas Town too. 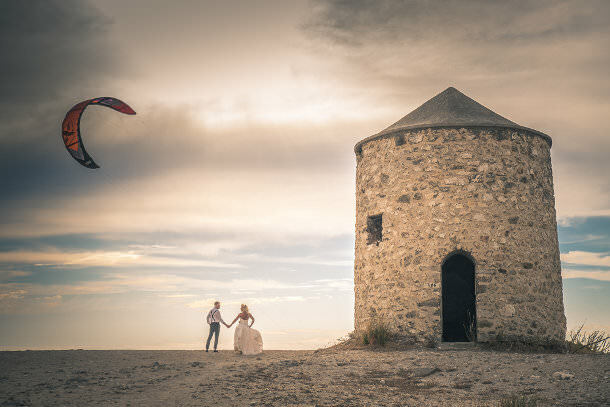 It was a great experience and lots of fun, we were relaxed, and together with our wedding day pictures, we have captured the beauty of the whole island." Everyone imagines their wedding night to be romantic but when we got back to the villa we realised neither of us had remembered the key! 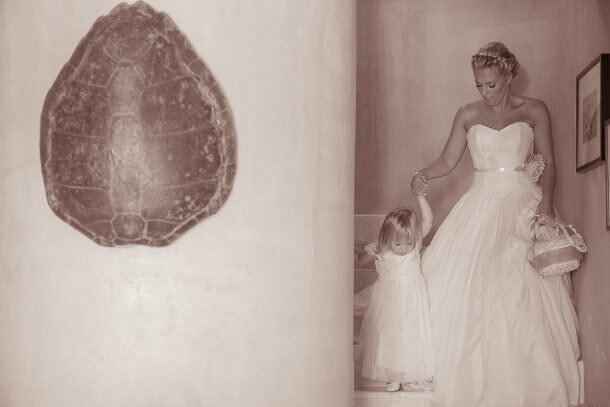 Alex said “Seeing Jenny walk down the aisle with Brooke and Ben was a really special moment that stood out for me”.